Researchers from the University of Cambridge have identified a class of low-cost, easily-processed semiconducting polymers which, despite their seemingly disorganised internal structure, can transport electrons as efficiently as expensive crystalline inorganic semiconductors. In this new polymer, about 70% of the electrons are free to travel, whereas in conventional polymers that number can be less than 50%. The materials approach intrinsic disorder-free limits, which would enable faster, more efficient flexible electronics and displays. The results are published today (5 November) in the journal Nature. For years, researchers have been searching for semiconducting polymers that can be solution processed and printed -- which makes them much cheaper -- but also retain well-defined electronic properties. These materials are used in printed electronic circuits, large-area solar cells and flexible LED displays. However, a major problem with these materials -- especially after they go through a messy wet coating, fast-drying printing process -- is that they have an internal structure more like a bowl of spaghetti than the beautifully ordered crystal lattice found in most electronic or optoelectronic devices. These nooks and crannies normally lead to poorer performance, as they make ideal places for the electrons which carry charge throughout the structure to become trapped and slowed down. Polymer molecules consist of at least one long backbone chain, with shorter chains at the sides. It is these side chains which make conjugated polymers easy to process, but they also increase the amount of disorder, leading to more trapped electrons and poorer performance. 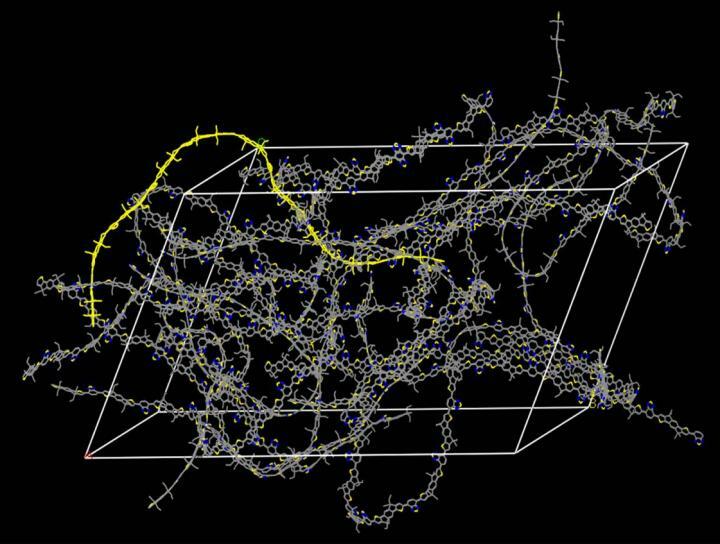 Now, the Cambridge researchers have discovered a class of conjugated polymers that are extremely tolerant to any form of disorder that is introduced by the side chains. "What is most surprising about these materials is that they appear amorphous, that is very disordered, at the microstructural level, while at the electronic level they allow electrons to move nearly as freely as in crystalline inorganic semiconductors," said Mark Nikolka, a PhD student at the University's Cavendish Laboratory and one of the lead authors of the study . Using a combination of electrical and optical measurements combined with molecular simulations, the team of researchers led by Professor Henning Sirringhaus were able to measure that, electronically, the materials are approaching disorder-free limits and that every molecular unit along the polymer chain is able to participate in the transport of charges. "These materials resemble tiny ribbons of graphene in which the electrons can zoom fast along the length of the polymer backbone, although not yet as fast as in graphene," said Dr Deepak Venkateshvaran, the paper's other lead author. "What makes them better than graphene, however, is they are much easier to process, and therefore much cheaper." The researchers plan to use these results to provide molecular design guidelines for a wider class of disorder-free conjugated polymers, which could open up a new range of flexible electronic applications. For example, these materials might be suitable for the electronics that will be needed to make the colour and video displays that are used in smartphones and tablets more lightweight, flexible and robust.